Hi! 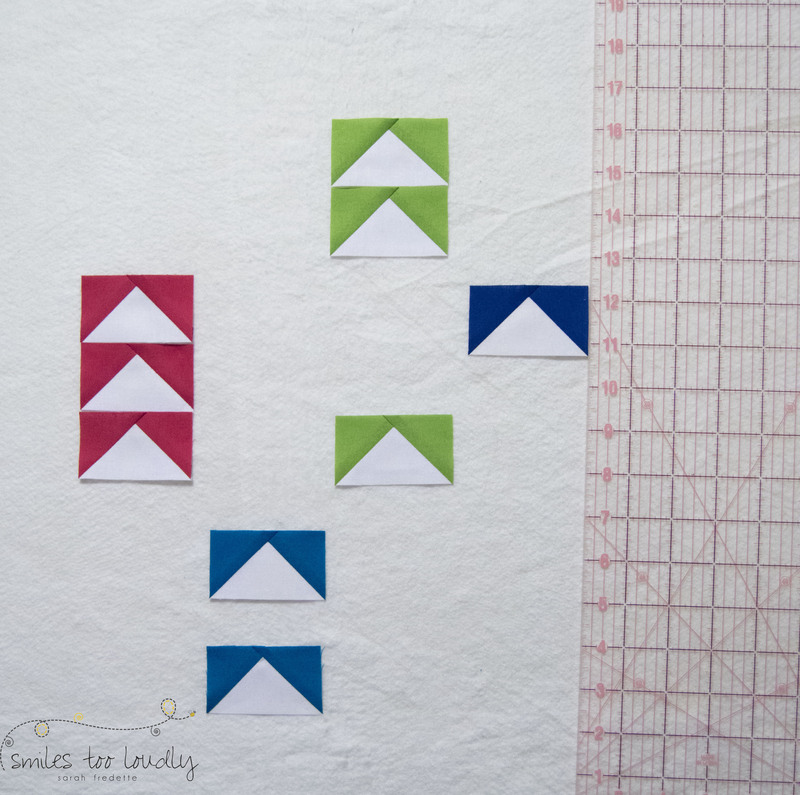 Today is the day I get to reveal an original block design for the Fabri-Quilt New Block Hop!!!! I waffled between several ideas, and finally settled on this one. It’s inspired by a flock of sparrows we have living near our apartment — these birds are completely fearless and have no sense of self-preservation. Seriously, they don’t understand the danger cars, people, or dogs could face, and never move out of the way. A little annoying at times, but they are pretty cute. 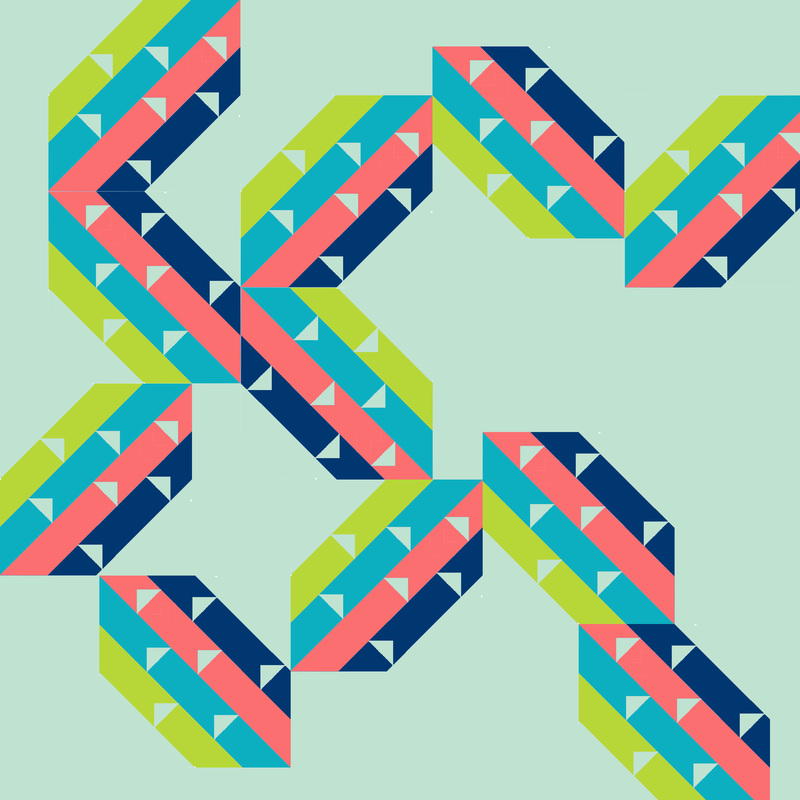 This block is almost an improv design, but not quite. So, I’m calling it a choose your own adventure style block. The geese sparrows can change/move to any position you want. 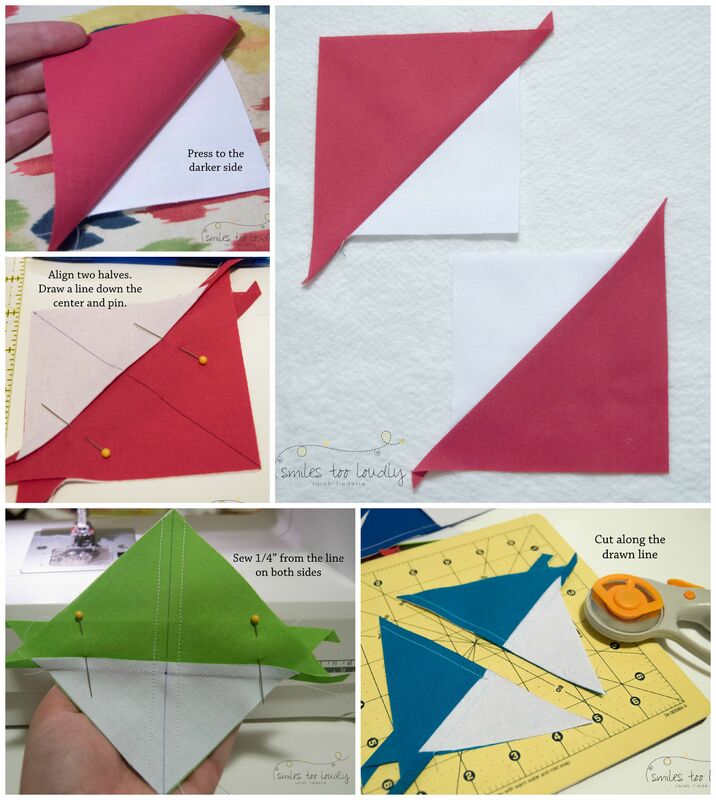 The directions will walk you through making four flying geese units for each color, but as you can see, you don’t need to use all four in one block. You could very easily make another block with the remaining geese. Shall we get started? 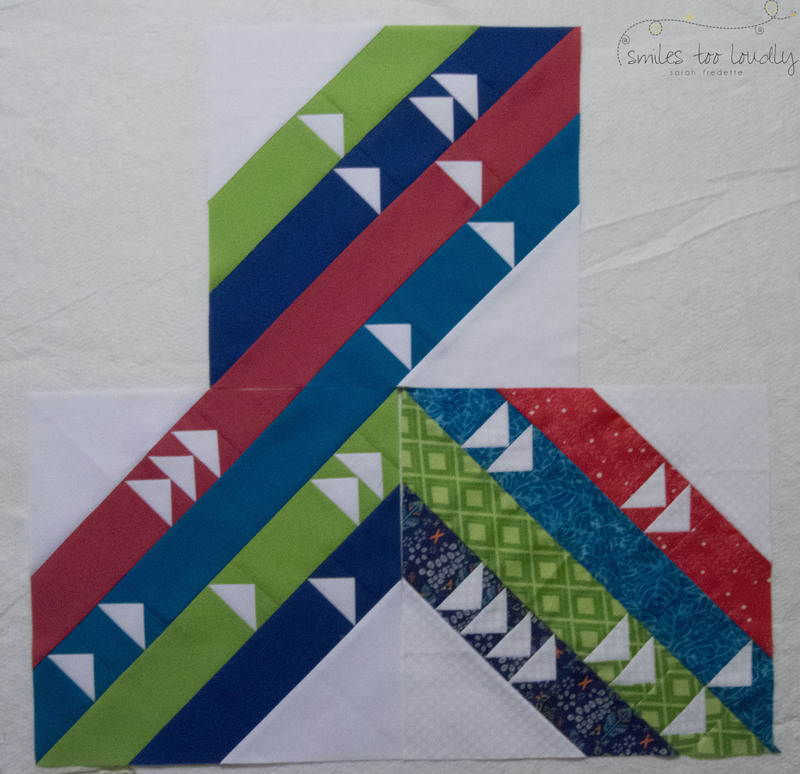 I used 5 of the 6 colors provided us by Fabri-Quilt: White, Coral, Turquoise, Charteuse, and Lapis Blue, but this block could easily be made with any combination of colors and/or prints. 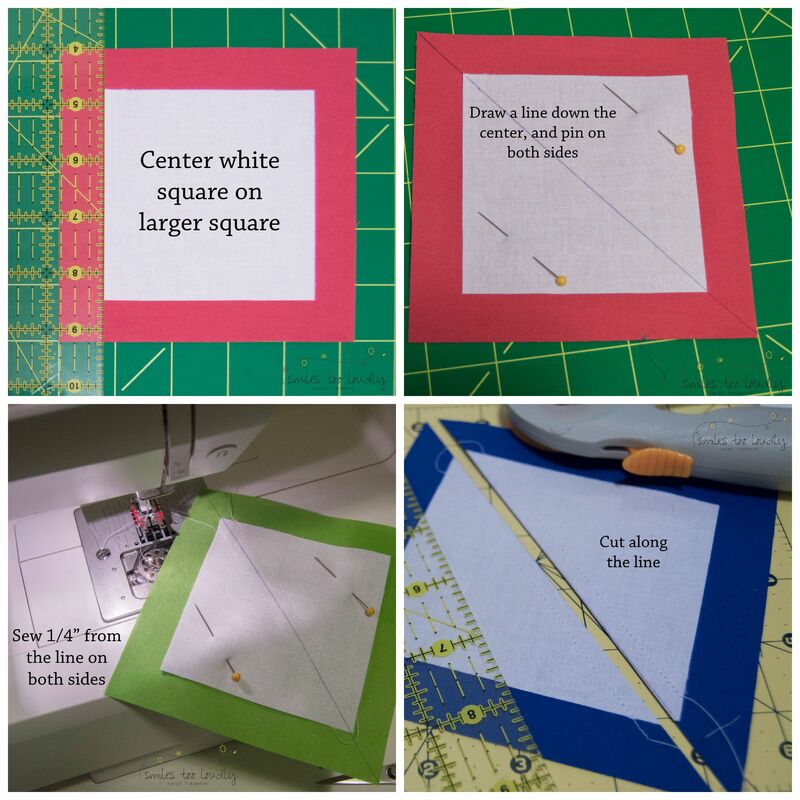 Draw a line down the center and pin on each side. Make sure the pins are far enough part that you won’t have to remove them while sewing. 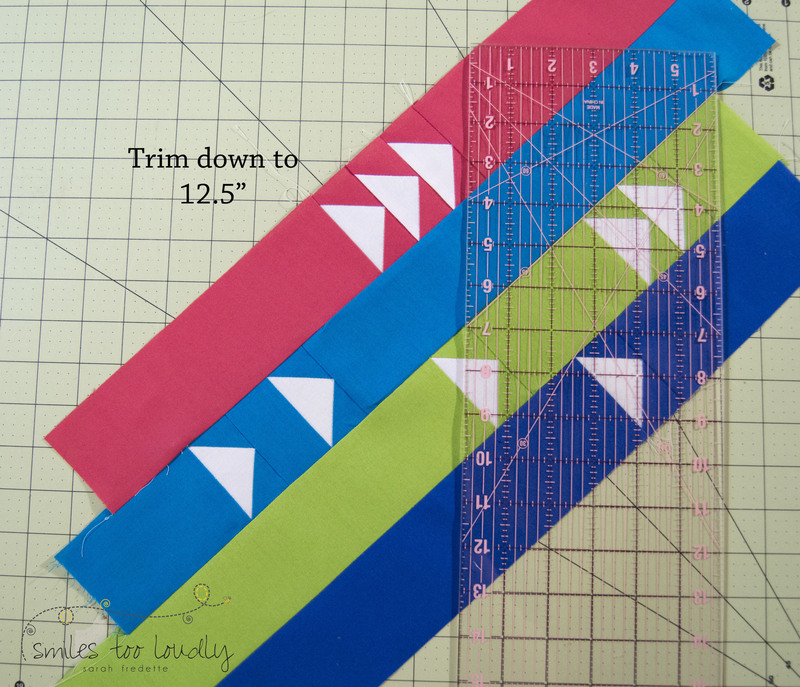 Sew 1/4″ from each side of the line. Repeat for all four colors. 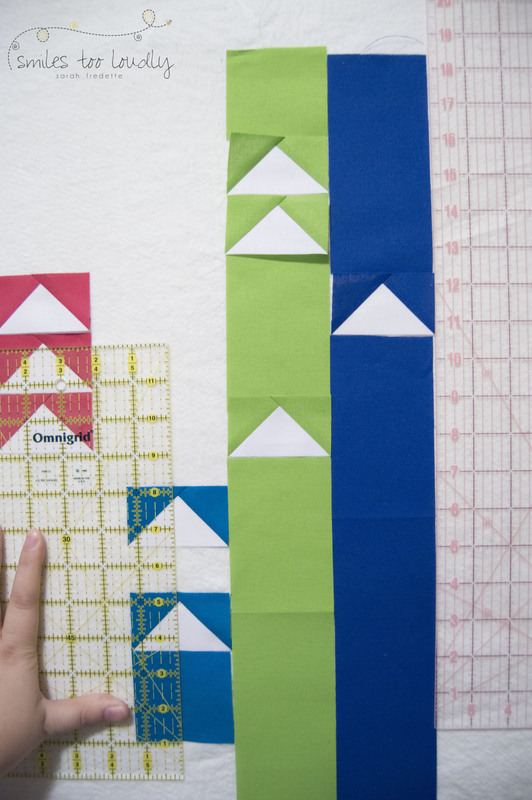 You should have a total of eight (8) triangles now. 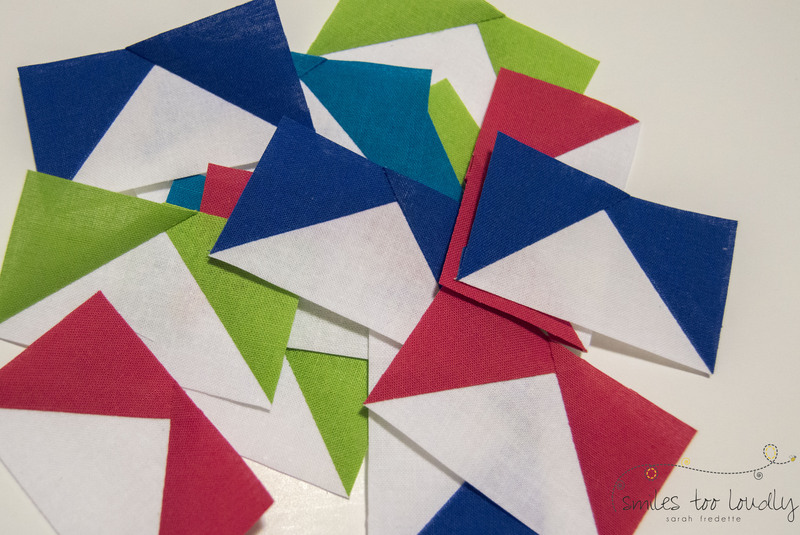 Press the blocks open, with the seam away from the white triangle. Now comes the tricky part. 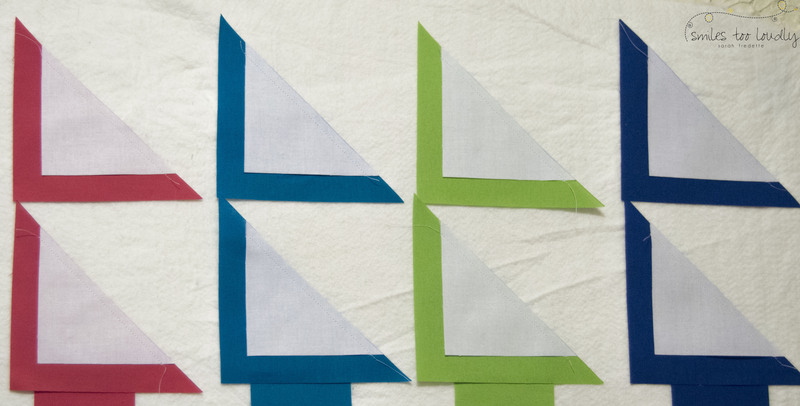 You want to take these weird looking HST’s and put them together, aligning a white corner with a color corner. This will look weird, and kind of wrong — but it’s not!!! 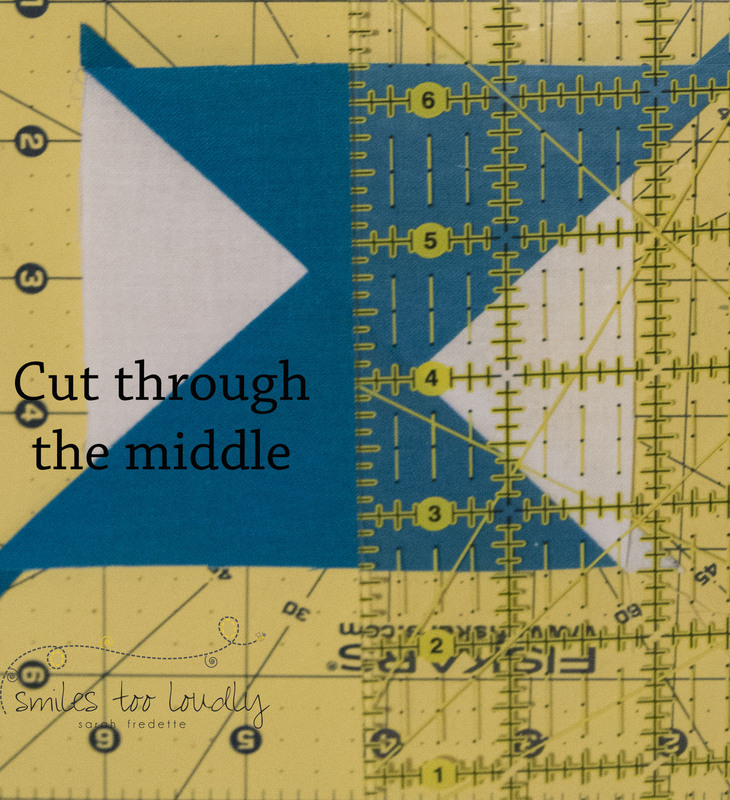 Draw a line down the middle, pin on both sides, and sew 1/4″ from each side of the line. Now you have these really weird looking pieces. You can just start to see the flying geese, right? 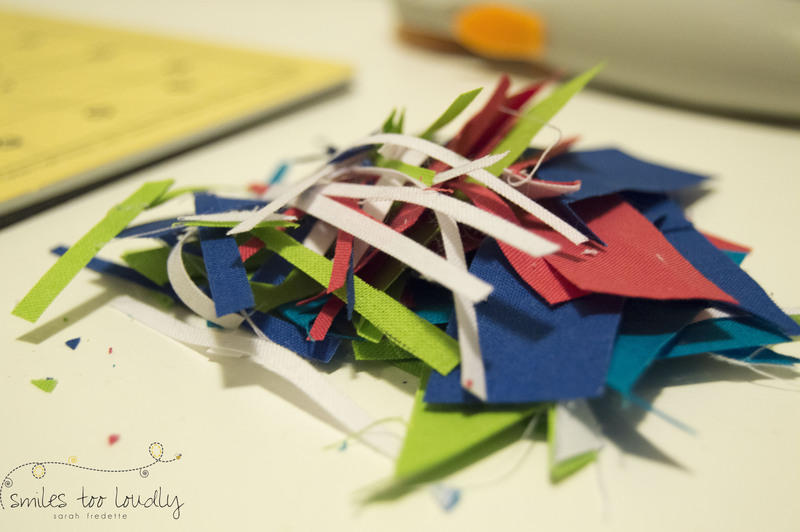 Cut through the middle of these pieces. It doesn’t have to be super exact, but don’t purposely make it wonky. There will be plenty of ‘slop’ to trim these into the units you need. Now comes everyone’s favorite part- trimming flying geese down to size. Since these aren’t a normal size, you’re going to need to get friendly with the alternative markings on your ruler, especially the 45 degree line. See how the 45 degree line is aligned with one edge of the goose? And the 1/4″ dots all hit the other edge of the goose? This makes sure you’re trimming the block to be square with the goose. (If you’re going for wonky geese — and awesome possibility!– you don’t need to worry about this as much). The final size of the flying geese unit is 2.75″ x 1.625″ (2 3/4 ” x 1 5/8″). Decide how many geese units you’re going to use per color, and what order you want the colors in. Layout your geese how you want them to appear. I chose to use only a few units, and to have them all flying the same way, but this is where yours get to be different than mine!!! 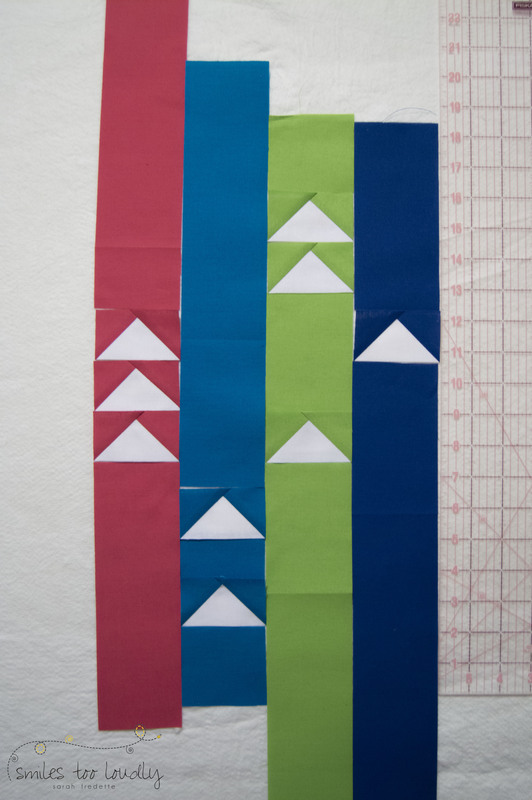 Sew the flying geese into the strips, then sew the strips together, all using 1/4″ seams. Press as desired (open and to the side will both work fine). I find this to be the exciting part — you can start to see how the block will look!!! 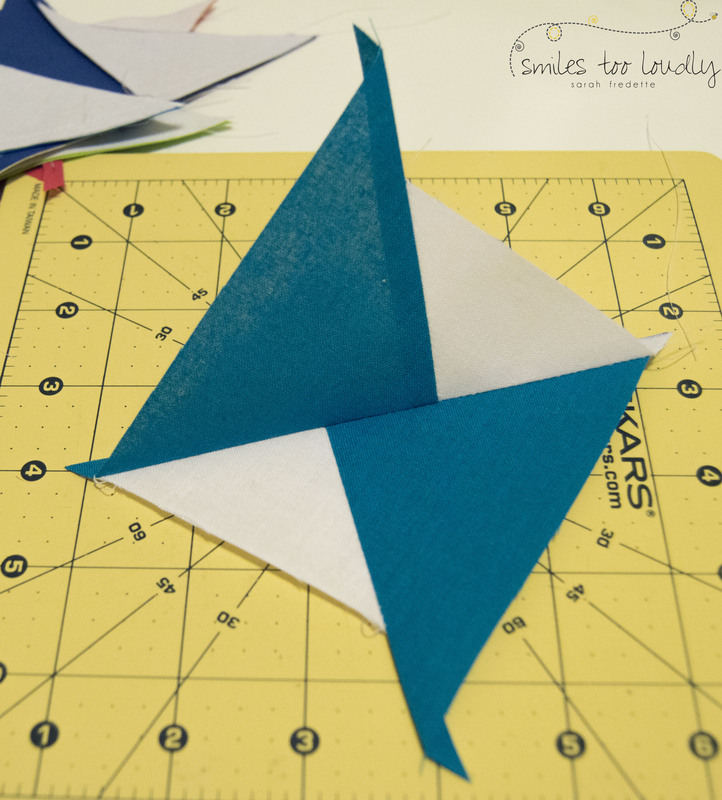 Before we can attach the large white triangles, we need to trim down the geese portion. 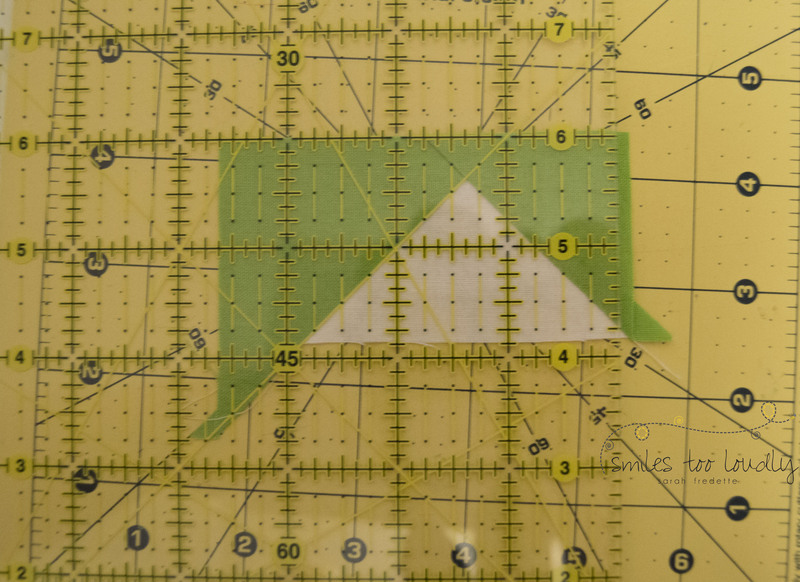 This will allow you to more precisely locate the white triangles, and hopefully avoid having to unsew anything.You want to trim to approximately 12.5″ — a little over is fine because you will be giving it another trim after attaching the white triangles. 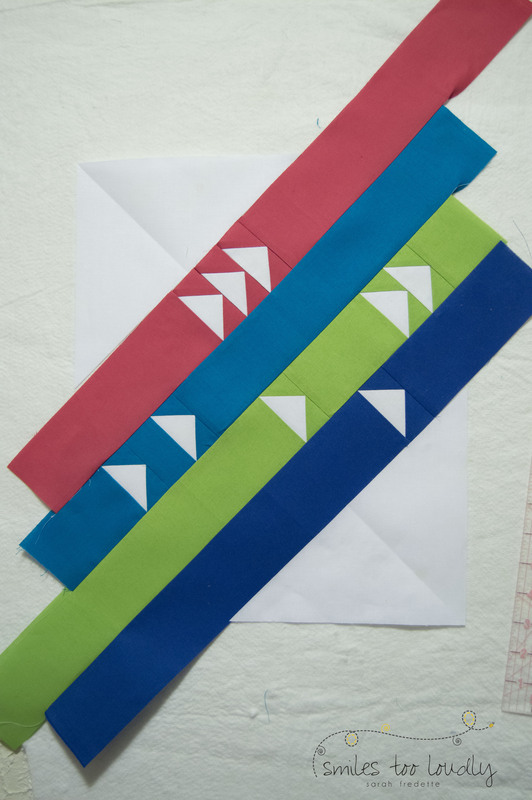 You want it to center down the middle of the strips (between the bright blue and green here), so place the 45 degree line of your ruler along that seam. Trim each corner. 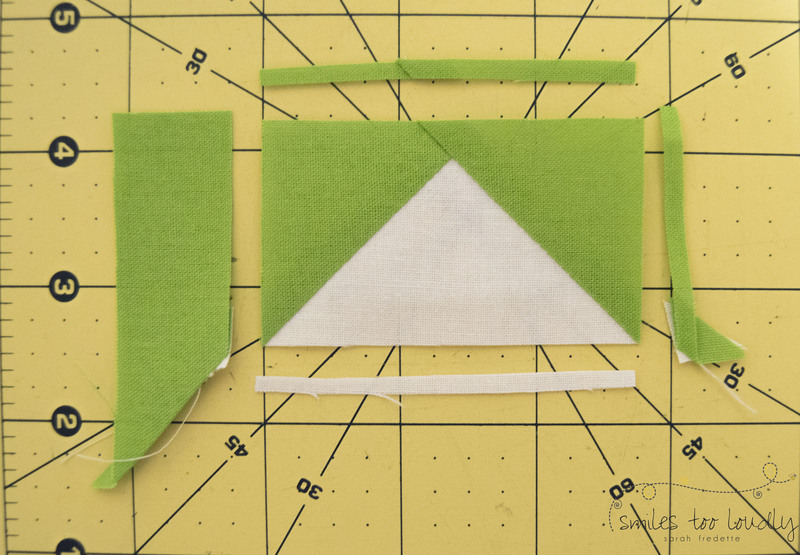 Now attach the white triangles using a 1/4″ seam. 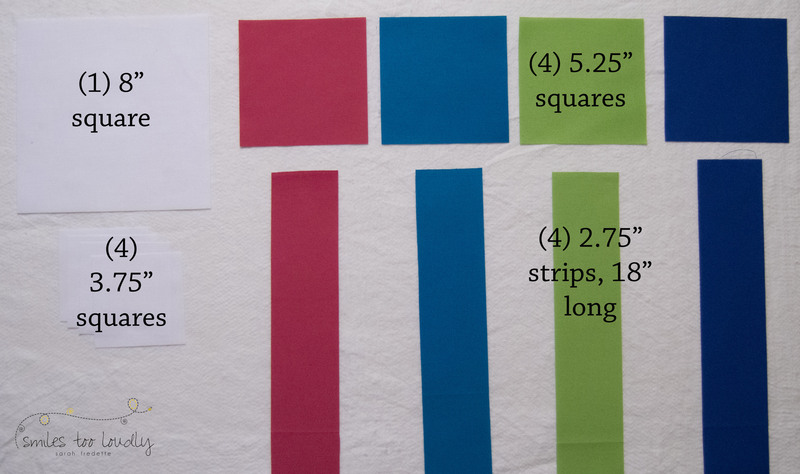 Since we started with an 8″ square, there will be a fair bit of slack, and you don’t need to precisely align the pieces. 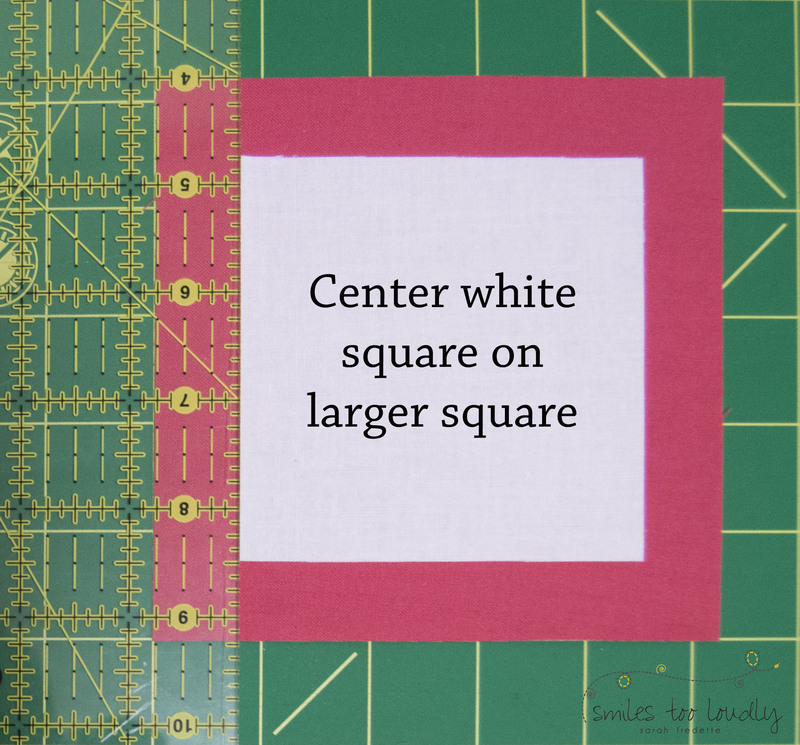 You could get away with a square as small as 7″, but then you have to be really careful how you align. I prefer the easiness of oversizing the pieces. So, you know how I said you could make another block with the extra geese? Well, that’s just what I did. I also made one in prints, because, you know, it had to be done. 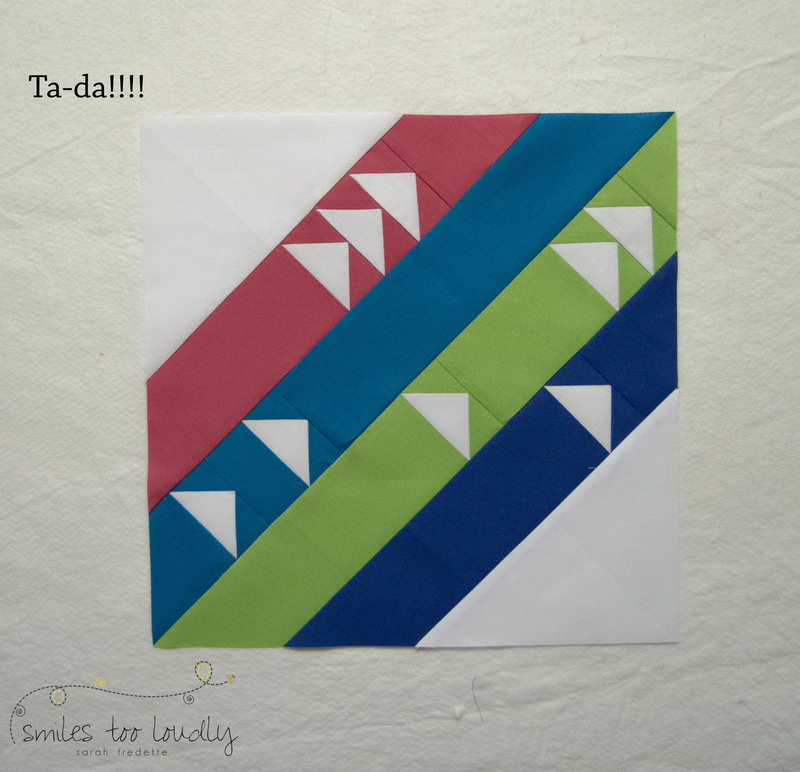 My husband liked this so much, he asked if I could do a full quilt like this someday…. so I of course turned to the computer to see what that could look like. It’s still a little rough around the design edges, but someday it’ll come into being. < New Block Tutorial, Coming Soon!!! 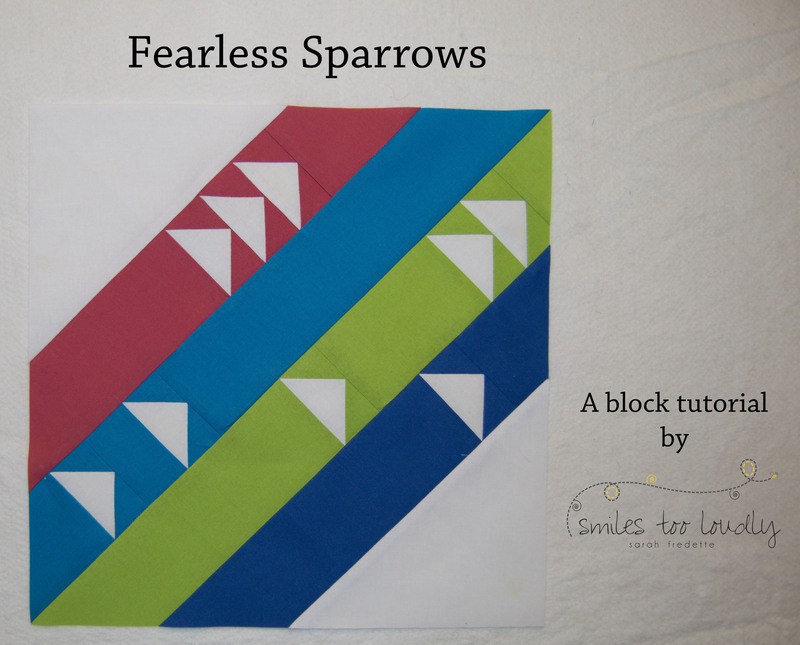 I know exactly what you mean about fearless sparrows, Sarah – brilliant name and visual for me to enjoy as I read your tutorial! 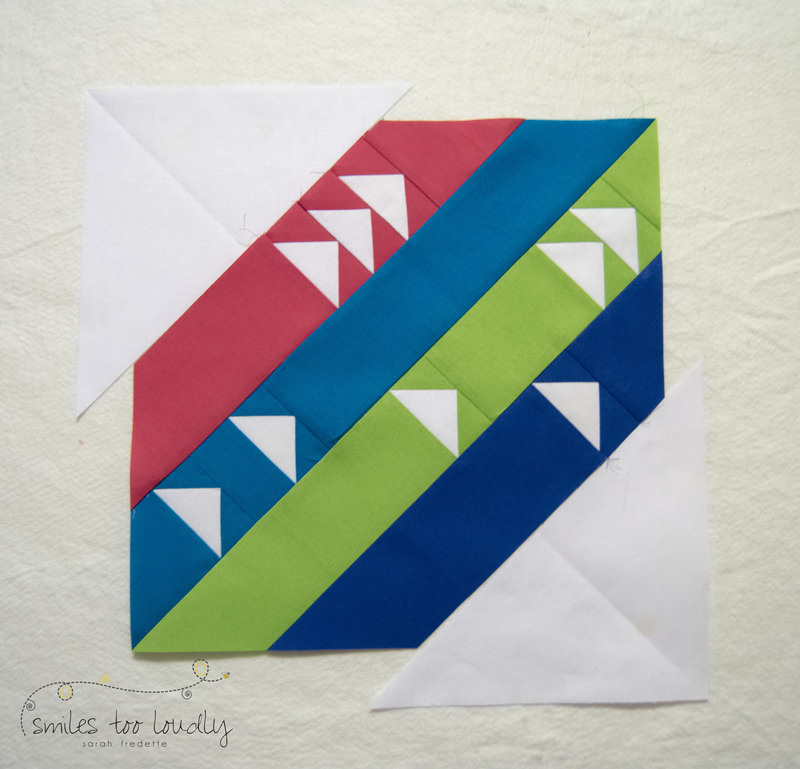 I love the bold slash of colors running at an angle through the block, and the fact that there is a bit of light improv or “choose your own adventure” to the block piecing also really appeals to me. Really like your block. Looked back on your blog a bit and I like your work. What a great block with the ability to make it your own. I think made with your design would be fun. What a fun block to make. I’m not sure I have seen geese constructed this way before, you have showed me something new. I love the name of the block. It does seem there are always flocks of those little critters everywhere. I love that you called it a choose your own adventure block! 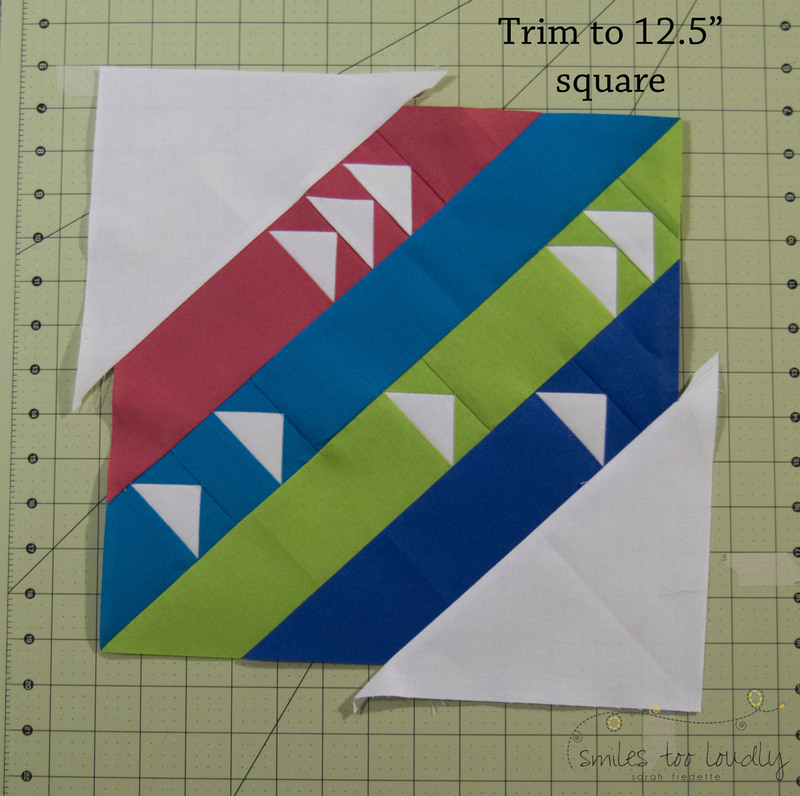 It’s a beautiful block, and it would be fun to make a whole quilt of little sparrows. LOVE, LOVE, LOVE!!! Now I have to start collecting some fabric for this one!! What a great block, I am fascinated with geese and love your take on them! I LOVE this block!!! I also love how your sample layout isn’t predictable with row after row of the block, you allowed for lots of negative space. I feel the same way about swallows, they’re so cute but they seem to carefree for their own good. What a fun use of flying geese blocks! Love seeing all the blocks together. 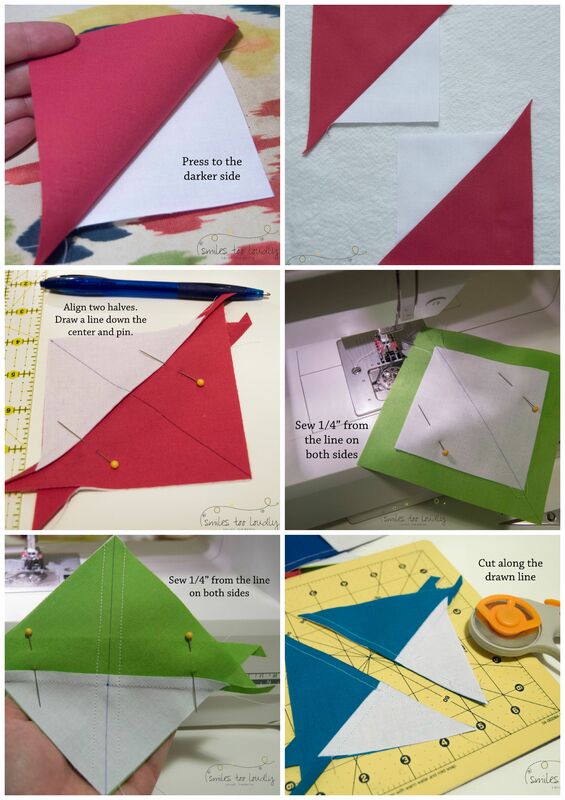 This is a great way to make multiple geese, thanks for sharing! Great block! Beautiful block! I love the strong diagonal lines across this block- very energetic! 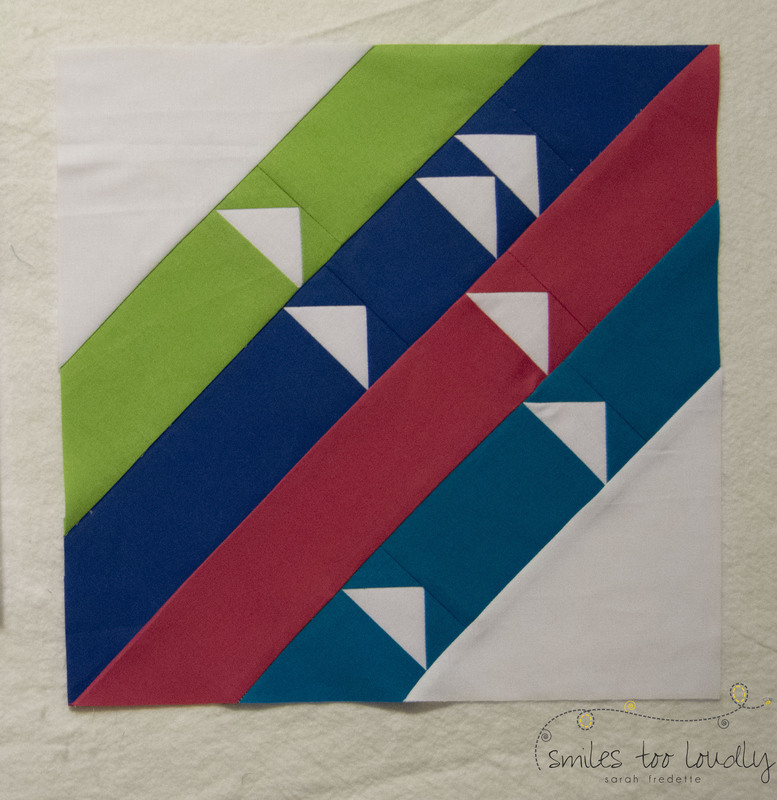 Thank you Sarah for your awesome tutorial and I love your block! 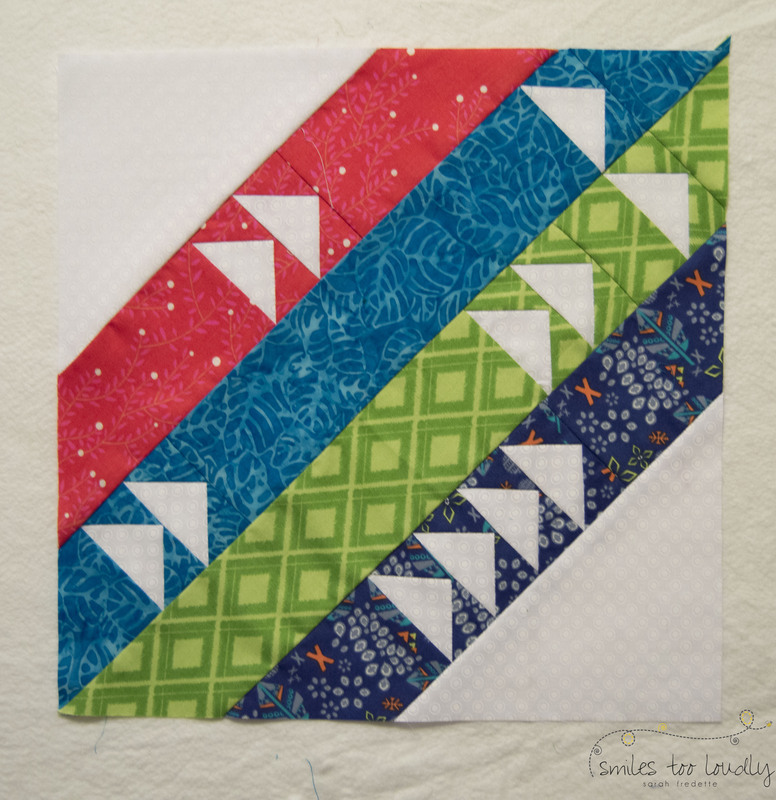 This is such a great block and I’ve never seen flying geese made that way before. Very cool! Thank you, thank you for showing the method of making corner triangles too large, and then trimming down. Delightful way of getting accurate corners! Nothing worse than realizing you’ve shorten your block in the last steps. And your sparrows definitely remind me of summers in Ohio. Thank you. This block is amazing! I love how versatile it is, and that you’ve included an improv element! I’ve never come across this flying geese technique before – I’ll have to give this one a try!